Background: By acting on multiple targets and promoting diverse actions, angiotensin II (Ang II) plays a pivotal role in vascular function. Recent studies suggested that phosphodiesterase-5 (PDE-5) inhibitors exhibit therapeutic effects in cardiovascular diseases. 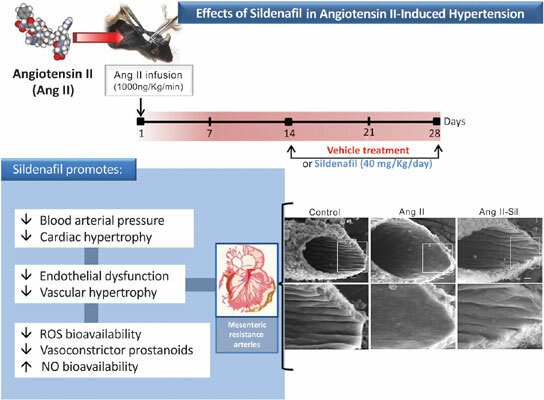 Here, the effects of sildenafil on vascular disturbances were analyzed in a mouse model of Ang II-induced hypertension. Methods and Results: Male C57BL/6 mice were used as untreated animals (control) or infused with Ang II (1000 ηg/kg/min) for 28 days and treated with sildenafil (40 mg/kg/min) or vehicle (Ang II) during the last two weeks. After 4 weeks, the Ang II animals exhibited a high systolic blood pressure (186±3 mmHg vs. 127±3 mmHg for control mice), which was attenuated by sildenafil (163±7 mmHg). The mesenteric vessels from the Ang II animals revealed damage to the endothelial layer, an increase in the cross-section area (1.9-fold) and vascular cell production of peroxynitrite (512±13 a.u. ), which was ameliorated in the Ang II-Sil group (1.2-fold and 400±17 a.u.). Analysis of the vascular responsiveness showed an increased contractility response to norepinephrine in Ang II animals (Rmax: 70%), which was abolished by sildenafil through increased nitric oxide (NO) bioavailability and decreased reactive oxygen species (ROS) and vasoconstrictor prostanoids. Conclusion: Sildenafil attenuates the morphofunctional deleterious effects of Ang II on resistance vessels. The benefits of sildenafil seem to occur through restoring the balance of ROS/NO/eicosanoids. Therefore, this study opened new avenues for further clinical targeting of the treatment of cardiovascular diseases related to activation of the renin-angiotensin system. Angiotensin, sildenafil, phosphodiesterase, ROS, nitric oxide, NADPH oxidase.